Introducing the new FOBUS Evolution Series Holster. The Evolution series is the next step in the advancement of holster development. A tension adjustment screw is incorporated to allow the user to customize the ease of presentation and the security of retention, functioning with the proven FOBUS passive retention design. 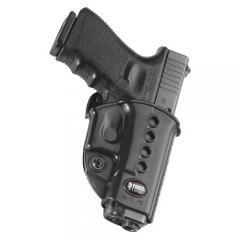 The new E2 series features one-piece holster body construction, and like all FOBUS Holsters, the Evolution, is lightweight and includes steel reinforced rivet attachment and a protective sight channel. Fits up to 1.75" Belt. Very nice and well built holster. Perfect for my S&W SD9 VE & Glock 31c.